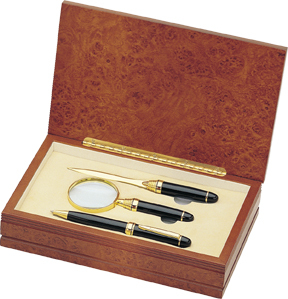 FEATURES/SPECS An elegant gift for the discerning professional, this pen, letter opener and magnifier gift set from the Executive Gift Shoppe will enhance the look of any desk top. 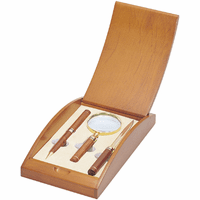 It includes a brass ballpoint pen, a matching letter opener, and a high quality magnifying glass all held in place with a foam insert. 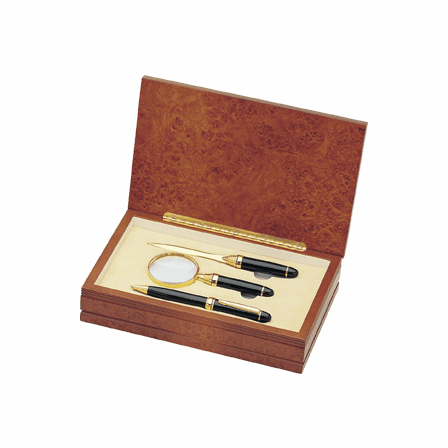 These desk instruments are packaged in a burl wood finish presentation box that will look magnificent in any setting. 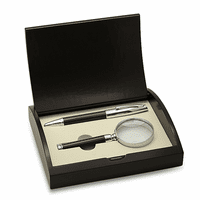 You can have the box personalized with the laser engraving of your choice at no extra charge, the ideal finishing touch on a great gift. 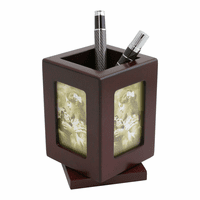 Dimensions: 9" x 5 1/2" x 2"
This product is absolutely stunning!